In this second post in a series of reflections on the New Directions in French History Conference in London in September Dr. Iain Stewart (UCL), explores the significance of the French liberal revival. On 17 October 1983 the French philosopher, sociologist and political commentator Raymond Aron collapsed and died as he was leaving a Parisian courthouse. Among the many tributes to appear in the next day’s newspapers, one in particular stood out. 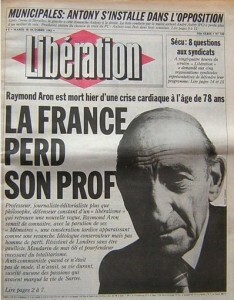 News of the death, accompanied by a large photograph of Aron, dominated the front page of the left-wing daily Libération. “France,” the headline announced with sad affection, “perd son prof”. There was, however, a certain irony to the fact that Libération’s coverage of Aron’s death was among the most extensive and admiring to appear in all the French press. For the paper had been established ten years earlier by a group of Maoists whose formative political experience had been the events of May-June 1968. Back then, when Aron was the bête noir of the student movement, he had been proclaimed unworthy of the title of professor by the most famous of Libération’s founding editors, . Indeed, such was the hostility towards Aron among some student activists in 1968 that one regular contributor to Libération apparently debated petrol bombing his seminar during the revolt. By the time of his death fifteen years later it would therefore seem that Raymond Aron had undergone something of a reputational transformation. Commentators at the time and ever since have seen the respect afforded to Aron from across the political spectrum at the end of his life as being emblematic of an underlying transformation in France’s political culture. This is because the canonisation of Raymond Aron occurred in the midst of an ideological sea change in French intellectual life that has come to be known as France’s “anti-totalitarian moment”. Until recently, this turning point in contemporary French intellectual history was typically regarded as having emerged in response to the publication of a French translation of Alexander Solzhenitsyn’s The Gulag Archipelago in 1974. Thirty years later, Michael Scott Christofferson’s revisionist account of France’s “anti-totalitarian moment” downplayed the significance of the so-called “Solzhenitsyn effect” and rightly highlighted the important rhetorical function of anti-totalitarianism at a time when the PCF looked set to return to government for the first time since the 1940s. But it would be a mistake to reduce French anti-totalitarianism to this. For many French intellectuals in these years saw totalitarianism not as something opposite and external to democracy but rather as a permanent possibility pregnant within democratic modernity itself. Late twentieth-century French reflection on the problem of totalitarianism was thus not just a rhetorical strategy aimed at discrediting an apparently resurgent communist party; much of it represented a serious attempt to rethink the history, theory and practice of modern democracy. One of the consequences of this was that the anti-totalitarian moment was accompanied by a rediscovery of “the political” (le politique) in French philosophy and historiography during the late 1970s and 1980s. And it was partly because of this anti-totalitarian preoccupation with the political that these decades also witnessed a broadening of interest in France’s nineteenth-century liberal tradition of political thought. This liberal turn in French thought is the subject of a volume that I am co-editing with Stephen W. Sawyer entitled In Search of the Liberal Moment: Democracy, Anti-totalitarianism and Intellectual Politics in France since 1950 (New York: Palgrave, 2016). Collaborating with Steve and our co-authors on this volume has made me rethink the recent intellectual history of French liberalism in many respects. The rediscovery of thinkers like Constant, Guizot and Tocqueville in the 1970s and 1980s, together with the wider preoccupation with broadly “liberal” themes like human rights and civil society that accompanied it, have typically been described as constituting a late twentieth-century “French liberal revival”. But this term is problematic. It parochialises a phenomenon not wholly specific to France, understates the complexity of what it could mean to engage with liberalism in the 1970s and ‘80s, and exaggerates the prior absence of liberalism from French political debate. Interrogating the assumptions underlying the notion of a “French liberal revival” is therefore essential. How French was the French liberal revival? If we look at its impact on historiography then the liberal revival looks like a predominantly Franco-French affair. Yet we need to de-parochialise France’s liberal moment if we are to address three important but under-researched questions: First, how do we integrate the French liberal moment into the wider intellectual history of neoliberalism? Second, what, if anything, did liberal revivalist intellectuals and politicians have to say about France’s post-colonial predicament? Third, how was French anti-totalitarianism and the liberal turn shaped by its transnational encounter with Central-East European intellectual “dissidence”? How liberal was the French liberal revival? Many participants in the rediscovery of French liberalism during the 1970s and 1980s never self-identified as liberals, despite engaging substantially with liberal ideas and traditions in their work. How should historians deal with this issue? One potentially useful distinction to make is between what we might call intellectual ‘canonizers’ and ‘magpies’, the former defining and aligning themselves with particular constructions of French liberal tradition while also drawing on the work of selected liberal predecessors to inform their work, the latter regarding French liberalism more as a useful conceptual toolbox than as a constitutive part of their political identity. Was it really a “revival” at all? The notion of a late twentieth-century French liberal “revival” is problematic firstly because it implies a reading of France’s republican political culture as being somehow endemically illiberal. This view is not totally without merit, but since it is in large part itself a product of the so-called “liberal revival” it is better to historicise this argument than take its claims at face value. Secondly, it is misleading to regard this moment in French intellectual history as entailing a revival of liberal texts that had fallen into total obscurity. The 1970s and 1980s instead saw a significant broadening in readership for a set of liberal authors whose work had recently been read predominantly on the radical and conservative right. Thus while there were plenty of liberal revivalists in France during the 1970s and 1980s, historians need to ask what was at stake in the rhetoric of liberal revivalism in these years. Here it is worth returning to our opening anecdote. Raymond Aron’s fatal heart attack struck as he was leaving a court having testified against the historian Zeev Sternhell in a libel case launched by the political theorist Bertrand de Jouvenel. In his book Ni droite, ni gauche: l’idéologie fasciste en France, Sternhell had described de Jouvenel as a fascist in the 1930s and insinuated that he had been a crypto-collaborator during the Occupation. Although the court found in de Jouvenel’s favour regarding his behaviour during the war, Sternhell was cleared of defamation on the question of de Jouvenel’s pre-war fascist entanglements. This case highlights the influence of memory and reputational politics on French intellectuals’ varied engagements with liberalism in the second half of the twentieth century. Liberal revivalism had been central to de Jouvenel’s efforts at laundering his political reputation during the 1950s and ‘60s, when joining the neo-liberal Mont Pelerin Society and the Congress for Cultural Freedom helped him rebuild his career through transnational bodies at a time when his reputation in France was severely damaged. The subsequent broadening of interest in liberalism during the 1970s and 1980s, and the reticence of those left-leaning liberal revivalists who were reluctant to self-identify as liberals, thus needs to be understood in the context of a longer intellectual history of liberalism in twentieth-century France. I am grateful to the organisers and participants in the ‘New Directions in French History’ conference for their feedback on the paper from which this post partly originates. Thanks also to Stephen W. Sawyer, whose comments and suggestions on my work in this field have been invaluable and informed much of what is written here. ‘La France a perdu son prof’, Libération 18/10/83. A further three pages were given over to discussing Aron’s life and legacy inside the paper. Jean-Paul Sartre, ‘Les bastilles de Raymond Aron,’ in Situations VIII: Autour de 68 (Paris: Gallimard, 1972), 175-92. The article originally appeared in the Nouvel Observateur on 19 June 1968. 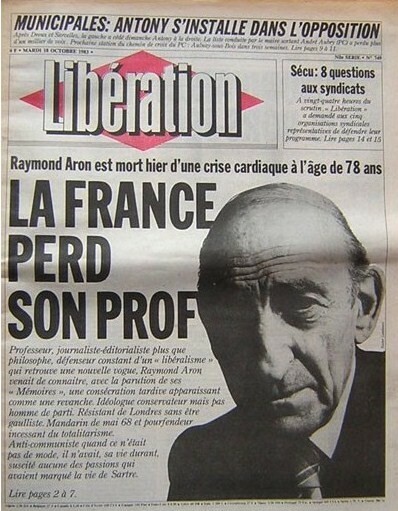 Philippe Raynaud, ‘La mort de Raymond Aron’, Esprit (December 1983), 123-24; Emile Chabal, A Divided Republic: Nation, State and Citizenship in Contemporary France (Cambridge: Cambridge University Press, 2015), 135-57. Michael Scott Christofferson, French Intellectuals against the Left: The Antitotalitarian Moment of the 1970s (New York: Berghahn, 2004). Tony Judt, Marxism and the French Left (Oxford, 1986), 1-4; Tony Judt, Past Imperfect: French Intellectuals, 1944-1956, (Oxford, 1992), 159, 238-241, Sunil Khilnani, Arguing Revolution: The Intellectual Left in Postwar France (London, 1993), 135-136; Mark Lilla, ‘New liberal thought’ in Lawrence D. Kritzman (ed. ), The Columbia History of Twentieth-Century French Thought (New York, 2006), 67-69, 68. Christofferson, French Intellectuals against the Left. For an account of how “the political” has been used in postwar French intellectual history see Samuel Moyn, ‘Concepts of the political in twentieth-century European thought’ in Jens Meierhenrich and Oliver Simons (eds. ), The Oxford Handbook of Carl Schmitt (forthcoming). I am grateful to Professor Moyn for providing me with an advance copy of this chapter. See also Warren Breckmann, Adventures of the Symbolic: Post-Marxism and Radical Democracy (New York: Columbia University Press, 2013), 147-165. For recent examples of this see e.g. Sudhir Hazareesingh, How the French Think: An Affectionate Portrait of an Intellectual People (London: Allen Lane, 2015), 241-45; Chabal, A Divided Republic, 135-57. In my own previous work I too have used both of these terms: see Iain Stewart, ‘France’s anti-68 liberal revival’ in Emile Chabal (ed. ), France since the 1970s: History, Politics and Memory in an Age of Uncertainty (London: Bloomsbury Academic, 2014), 199-223; Iain Stewart, ‘Raymond Aron and the Roots of the French Liberal Renaissance’, (University of Manchester: PhD Dissertation, 2011). It is through my recent collaboration with Stephen Sawyer that I have come to rethink this issue: see the introduction and epilogue to Stephen W. Sawyer and Iain Stewart (eds. ), In Search of the Liberal Moment: Democracy, Anti-totalitarianism and Intellectual Politics in France since the 1950s (New York: Palgrave, 2016). For a critique of this view Jean-Fabien Spitz, Le moment républicain en France (Paris: Gallimard, 2005). For a version of this argument in English see Jean-Fabien Spitz, ‘On the supposed illiberalism of republican political culture in France’ in Sawyer and Stewart (eds. ), In Search of the Liberal Moment. Zeev Sternhell, Ni Droite ni gauche: l’idéologie fasciste en France, quatrième édition (Paris: Gallimard, 2012) contains an appendix with Sternhell’s reclections on the de Jouvenel trial. On de Jouvenel see the recent biography by Olivier Dard, Bertrand de Jouvenel (Paris: Perrin, 2008). Next Can post-war French historians be subjects of history?